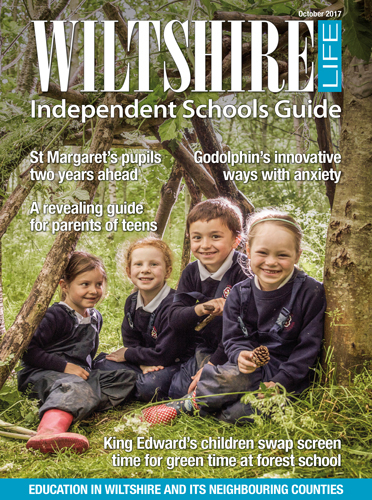 FREE with the October issue of Wiltshire Life is our Independent Schools Guide which rounds up all the latest news from schools across the area. We take an in-depth look at new methods of learning and how these are reaping rewards at schools such as Dauntsey’s in West Lavington and St Margaret’s Prep in Calne. You’ll be able to meet the heads of two leading independent schools and find out why they went into teaching, plus what makes their school unique. We take a look, too, at a forest school where young pupils are swapping screen time for green time. At the back of the guide, you’ll find comprehensive listings to help you find the right school for your child or grandchild. It’s always wonderful when young people get remarkable results and we’re pleased to be able to list in this issue some of the pupils who have done very well in their GCSEs and A-levels. Similarly upbeat, is the story from St Margaret’s Prep. Headmistress Karen Cordon, her staff and pupils have been taking part in some cutting-edge research which is already bringing huge benefits to pupils and their parents. This supplement is published twice a year and one of the things I particularly like about it is the chance to meet the heads of some leading schools. In this month’s issue, we focus on Pinewood and Wells Cathedral School. Finally, I couldn’t help feeling just a little overawed at the incredible stamina of Warminster’s headmaster who undertook the Marathon des Sables this year. What an example to set for his young pupils!